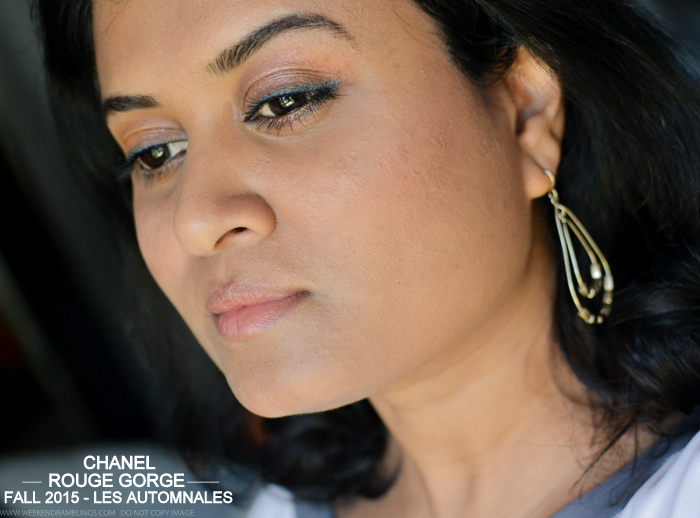 Chanel Fall 2015 Makeup Collection - Les Automnales - is one of my favorite makeup collections to launch this year, and among the few proucts that I picked from this collection is the new Illusion D'Ombre in Rouge Gorge. Chanel Illusion D'Ombre - cream eyeshadows - have been around for a while, but I have stayed away from these because of the abundance of shimmer in most of them. From the promo images, Rouge Gorge seemed like a matte formula, and since I couldn't find a tester to try it in store, I decided to buy it anyway and test out Nordstrom's fabulous return policy if things turned too sparkly :P Scroll on for more photos and review. 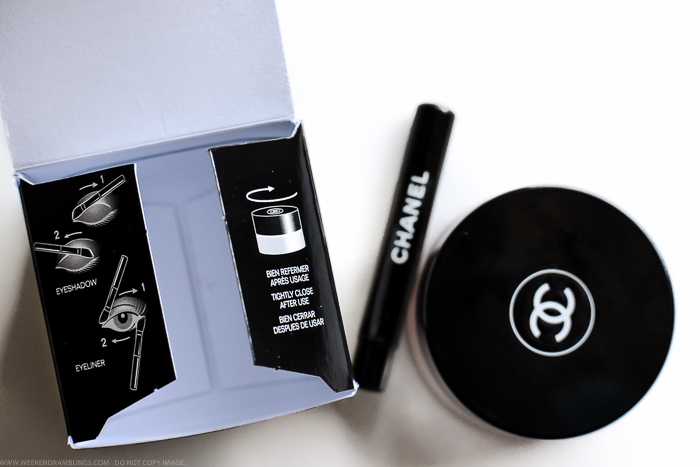 Chanel Illusion D'Ombre comes packaged in a flat glass pot, and a handy brush applicator is included in the packaging. The brush looks almost like a mini lip brush but does a good job at picking up the product and applying it. 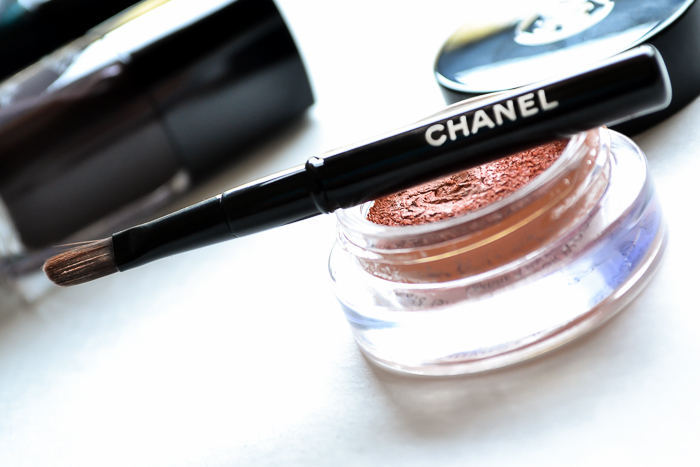 Chanel Rouge Gorge - In the pot, it appears like an orange cream with no shimmer visible. The texture is different from other cream eyeshadows I have tried. Using finger (or a brush) to pick up the product mostly displaces the cream, and I end up picking just a thin layer of product on my finger. The package/cover includes instruction on applying the product. Use the mini brush to pick up product and with the flat side apply all over lid. Or use the tapered edge to apply the product like a liner along the lashline. 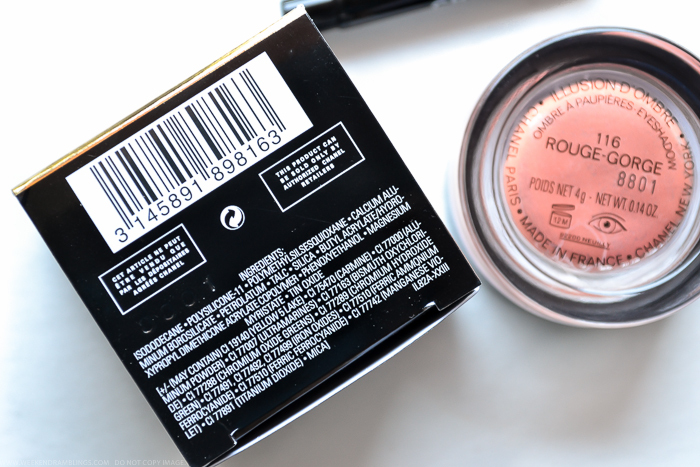 Going by the appearance in the pot, I was expecting Rouge Gorge to be a matte orangey cream eyeshadow. On my skin, though, when applied heavily it shows up as a pastel peachy orange shade. There is very fine pink and siliver microshimmer mixed in that's only visible on closer inspection (look coppery under warm lighting). The overall effect on the skin is a glossy peachy-orange sheen. 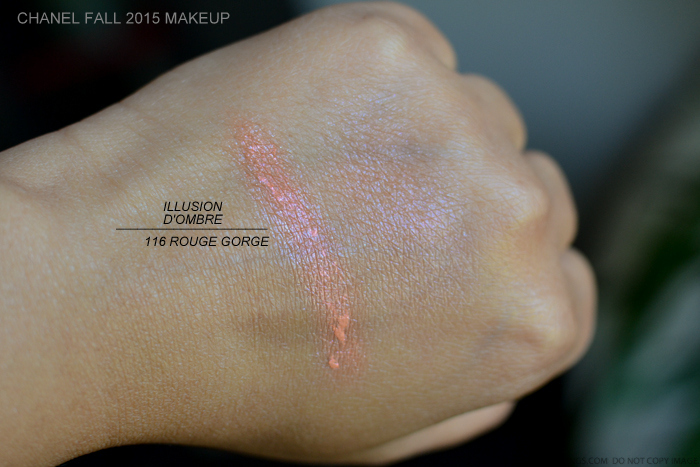 I have been wearing Chanel Illusion D'Ombre in Rouge Gorge for a while now, and I love it. The glossy sheen and the subtle shimmer adds a freshness to the lids, and while this is part of a fall collection, for me, this is perfect for using all summer. I have dark eyelids, and the peach-orange color neutralizes the dark pigmentation and shows up as a subtle orangey peach haze on my lids. It stays on the whole day without any primer, and I can use it either on it's own (as in the photo below) or as a base under other eyeshadows. 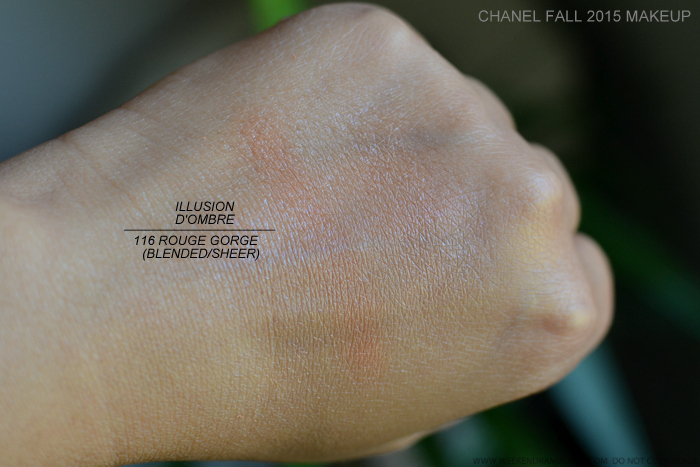 Wearing Chanel Illusion D'Ombre in Rouge Gorge over the lids, Urban Decay Mainline smudged along lashline, Urban Decay Scorch along lower waterline. Details of other products used in this makeup tutorial. 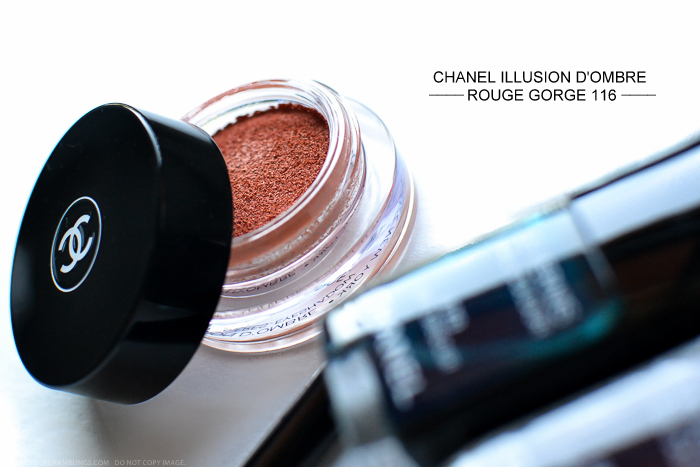 Chanel Illusion D'Ombre in Rouge Gorge is turning out to be one of my favorite eye makeup products. 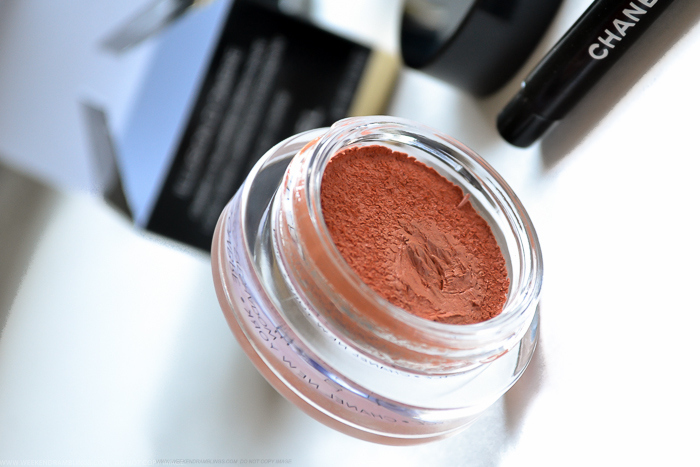 I love warm-neutral eyeshadows, and this color works perfectly on my skin tone, both as a base as well as an all-over lid colour. It's longlasting, and I love the microshimmer in this - doesn't look too glittery and doesn't wander all over the face as the day wears on. For me, this is a must-have product, and I am quite tempted to get a backup (am waiting on a similar Tom Ford product, though). The one issue I have with the product is the texture/formula. I can use fingers, but for the sake of keeping the product clean (and lasting longer) and for ease of application, I prefer using a clean blending brush to apply the eyeshadow. Unfortunately, the texture is a little odd, and the product tends to get pushed around in the pot and very less actually gets picked up (even on my fingers). It also tends to pick up every little stray fiber and/or any color that is already on the brush. I have the same issue with Chanel cream blushes - they look so messy after a while. For now, I scoop up some of the cream eyeshadow with the mini brush and apply to back of my hand, then use fingers or brush to apply over lids. If you know an easier way, please let me know. Links provided in the post are for information only and are NOT affiliate/sponsored links. Please do not copy/download images to republish on your social media channels or blog posts. So pretty Radhika! I ordered New Moon from this collection, I saw a tester for Gorge is store and it looked so orange! But I love how subtle it looks on you. Now since our coloring is similar, consider me tempted! :-p Did you check out the blush from this collection, any thoughts?